The Cuban exile is another country; Miami is its capital. As is well known, the Cuban exodus to the US has taken place over the course of several major waves. Nelson Amaro and Alejandro Portes (1972) portrayed the different phases of the Cuban migration as changing over time with the exiles’ principal motivation for their decision to leave. With the unfolding of the Cuban revolution, they argued, over the years “those who wait” gave way to “those who escape,” and they to “those who search.” To update their analysis, I added “those who hope” and “those who despair” (Pedraza 1996). In the first wave (1959–1962), those who left were Cuba’s elite: executives and owners of firms, big merchants, sugar mill owners, cattlemen, representatives of foreign companies, and professionals. They left Cuba when the revolution overturned the old social order through measures such as the nationalization of American industry and agrarian reform laws, as well as through the United States’ severance of diplomatic and economic ties with Cuba. “Those who wait” characterized these first refugees that came imagining that exile would be temporary, waiting for American help to overthrow Cuba’s new government. This first phase of the exodus began with the triumph of the revolution in 1959 and ended with the failure of the exiles’ Bay of Pigs invasion in April 1961 (cf. Domínguez 1978; Farber 2006; Fernández 2000). “Those who escape” constituted the second phase of the first wave that was set on by the growing political turmoil when the Catholic church, which denounced the revolution, was silenced; the electoral system collapsed; civil society, including the independent press, radio and television stations, were closed; and Castro announced that he had always been a Marxist-Leninist and would be so until the day he died. As a result, the exodus doubled. As Amaro and Portes noted, the inverse relationship between date of emigration and social class in Cuba began to show. Still largely a middle-class exodus, now it was more middle than upper: middle merchants and middle management, landlords, middle-level professionals, and a considerable number of skilled unionized workers who wanted to escape an intolerable new order. The 1990 US Census provides a better estimate for the early waves of migration, while the 2000 and 2010 Censuses provides a better estimate for the more recent waves of migration. According to the 1990 census estimates, from 1960–1964, around 172,919 Cubans arrived. The first wave ended in October 1962 when, as a result of the Cuban Missile Crisis, all flights between Cuba and the US ceased. In the fall of 1965 a chaotic flotilla exodus began, when hundreds of boats left from Miami to the Cuban port of Camarioca, where they picked up thousands of relatives to come to the US. As a result, the United States and Cuban governments negotiated the orderly departure of Cubans through an air bridge, the Vuelos de la Libertad, which brought Cubans to the US on daily flights called “freedom flights”. They began in 1965 and lasted until 1974, when the Cuban Refugee Program ended. According to Amaro and Portes (1972), “those who search” characterized this wave of migration that was largely composed of the working class and la petite bourgeoisie: employees, craftsmen, small merchants, skilled, and semi-skilled workers. They left Cuba during what were some of the leanest and most idealistic years of the revolution. While the Cuban government made real efforts to spread access to a basic education and health care across all social classes and from city to countryside, the hemispheric trade embargo began to be felt; the exodus continued to be a “brain drain” of skilled professionals; and Cuba failed in her attempts to cease being a sugar monoculture. Thus, in Amaro and Portes’ judgment, increasingly the migration ceased to be a political act and became an economic act. Yet their distinction ignored that while life in Cuba grew harsh for all, it turned bitter for those who had declared their intention to leave. When the migration began in the early 1960s, 31% of the arriving Cubans were professionals or managers; by 1970, that proportion more than halved, to only 12%, while more than half of the arrivals were blue-collar, service, or agricultural workers (Aguirre 1976: Table 2). When the air bridge ended in 1974, refugees that had first lived in Spain arrived. Alejandro Portes, Juan Clark, and Robert Bach (1977) found that these émigrés represented Cuba’s “middling service sectors”: cooks, gardeners, domestics, street vendors, barbers, hairdressers, taxi drivers, small retail merchants. They left Cuba when Castro launched a new “revolutionary offensive” in Cuba, confiscating over 55,000 small businesses that were privately owned (Mesa-Lago 1978). This “pushed” out the small entrepreneurs and their employees, while the presence of family already in the US “pulled” them (cf. Lee 1966). As Peter I. Rose (1981) underscored, refugees are more “pushed” than “pulled.” Data from the 2000 Special Tabulations of the US Census show that of the 872,715 Cubans in the US then, over half — 54%—entered the US before 1980 (US Census Bureau 2000). With the economic transition to socialism accomplished, in the 1970s the Cuban government cast the shape of the political system—an institutionalization during which Cuba took on the features of Eastern European communism (cf. Roca 1977; Domínguez 1978). The old idealism and romanticism of the 1960s gave way to what Carmelo Mesa-Lago (1978) called pragmatism. Miami’s Cubans then set themselves to the task of re-creating the Cuba they knew and longed for, and of preserving the old culture. As David Rieff (1993) expressed it, Cuba was in the heart of Miami — quite visibly. In 1978, a Dialogue took place between the Cuban government and representatives of the Cuban exile. As a result, the Cuban government agreed to the release of 3,600 political prisoners and to promote the reunification of families by allowing Cubans in the US to visit their families. Those visits were partly responsible for the third wave—the chaotic flotilla exodus from the harbor of Mariel in 1980 that brought over 125,000 more Cubans to America. From Miami, Cubans sailed to Mariel bring their families to the US. At times they succeeded, other times they brought whomever angry Cuban government officials put on the boats. This included Cuba’s social undesirables, whom Castro called escoria (scum): those who were in prisons (whether they had committed real crimes or had only challenged the state); mental patients; and gays (cf. Montgomery 1981). Robert Bach’s (1980; 1981/82) studies showed that the most salient characteristic of the Marielitos was their youth: most were young men, single or without their families. Moreover, there was a visibly higher proportion of Blacks than earlier. Their occupations showed that most were from the mainstream of the Cuban economy, hardly scum. This last exodus was overwhelmingly working class—close to 71% were blue-collar workers. In addition, a significant number of young intellectuals were also part of this wave (the most famous of which was Reinaldo Arenas). These writers recognized themselves as belonging to a distinct political generation (cf. Aguilar-León 1972). They themselves called it la generación del Mariel. “Those who hope,” I said, might well characterize this wave (Pedraza 1996). Because of their youth, the Marielitos clearly constituted a different political generation, defined by Karl Mannheim (1952), as constituted by individuals of approximately the same age who share, in their coming of age, certain politically relevant experiences that shape their outlook. The Marielitos’ coming of age occurred long after the early revolutionary struggle that demanded enormous sacrifices but affirmed the loyalty of many. Roughly half of the Mariel immigrants came of age during the late 1960s or the 1970s, at a time when problems of freedom of expression became acute, especially for artists and intellectuals, and deviance, particularly homosexuality, was dealt with by prison sentence. The Marielitos, therefore, were a significantly different “vintage” than the early exiles (cf. Kunz 1971; 1983). Over time the dramatic changes the Cuban revolution underwent interacted with the social characteristics of those affected to produce markedly different processes of political disaffection. As the 1980s came to a close, a new Cuban exodus began that has yet to cease. Cuba’s economic crisis reached new depths when communism collapsed in the Soviet Union, a generous benefactor on whom Cuba had been enormously dependent. The impact of these losses was devastating, so that Castro himself declared this “a special period in a time of peace.” Abject need and hunger defined Cubans’ lives. Such a período especial was supposedly temporary, but coupled with the United States’ tightening of the embargo, went on for many years (cf. Domínguez et al. 2004). Beginning in 2000 Hugo Chávez, Venezuela’s new socialist President, came to the rescue with support he exchanged for Cuba’s medical personnel working in his Barrio Adentro (into the barrios) program in Venezuela. Initially, this new Cuban exodus was mostly illegal (cf. Rodríguez-Chavez 1994). Cubans became so desperate they left on balsas (rafts, tires, makeshift vessels), risking death due to starvation, dehydration, drowning, or sharks. From 1985 to 1993, close to 6,000 balseros managed to reach the United States safely; over 34,000 left just in the summer of 1994 when, in the midst of a crisis, Castro suddenly instructed the Cuban Coast Guard to let them go. Due to the high risk entailed in this acute refugee movement, it was mostly male-dominated. In the US, an abrupt change in policy took place, as then Attorney General Janet Reno declared the balseros were illegal aliens trying to enter the US; hence, to be avoided. This contrasted sharply with the longstanding US view that Cubans were victims of communism; hence, deserving a welcome. The US Coast Guard blocked their progress at sea and directed them to Guantanamo. “Those who despair,” I stressed, constituted this wave. In 2000, 20% of the foreign-born population from Cuba had entered the US from 1980 to 1989 (US Census Bureau 2000). The US and Cuba signed a new Migration Agreement and Guantanamo’s balseros were resettled throughout the US. Thereafter, the majority of Cubans who came to the US did so legally, though some Cubans crossed the US-Mexico border surreptitiously and still others crossed the ocean with the help of the new lancheros (speed-boat operators) that brought people from the island illegally, leaving them to fend for themselves on the coast of Florida or nearby in small keys. After 56 years of Cuba in revolution, and the many different political and economic cycles the revolution has gone through, contrary to the monolithic way in which most Americans view the Cuban American community, in fact it is very heterogeneous, composed of what E. F. Kunz (1973; 1981) called different “vintages” (as in the wine of this year or that year): groups of émigrés that have undergone very different processes of maturation in the Cuba they were impelled to leave. After 56 years of Cuba in revolution, and the many different political and economic cycles the revolution has gone through, for the many waves of immigrants that reside in Miami, the Cuba of memory and desire is not the same Cuba. Due to the various historical moments through which the exiles lived, and their different “vintages”, the various waves have consistently differed in their attitudes towards Cuba. The Florida International University Cuba Polls (FIU Polls), conducted by Guillermo Grenier and Hugh Gladwin (2014), under the auspices of the Cuban Research Institute (CRI), has been tracking attitudes of Cubans for many years. Beginning in 1991 (with 2 polls in that year), other polls followed in 1993, 1995, 1997, 2000, 2004, 2007, 2008, 2011, and the most recent in 2014– fully 23 years of trends in attitudes. The 2014 poll surveyed a random sample of 1,000 Cuban Americans living in Miami-Dade County. Thus, we have a good demographic picture of the differences in the political attitudes of Cubans in Miami towards Cuba by their waves of migration, and how these have changed or remained stable over time. These various waves are well approximated by the FIU Poll’s data that is presented separately by the year the immigrant respondents left Cuba: 1959– 1964 (the first wave), 1965–1973 (the second wave), 1974–1980 (the Mariel exodus), 1981–1994 (the balseros), and 1995–2014 (the most recent immigrants). The differences are particularly marked between the “Old” Cubans and the “New” Cubans. The “Old” Cubans are those who left the island in the first two waves of the exodus (1959–1973), when Cuba was in the process of transition from the former Cuba that was democratic and capitalist to a new society that re-organized itself along a communist blueprint. The “New” Cubans are those who left the island in the last couple of waves of the exodus, particularly after the collapse of communism in the Soviet Union and the Eastern European communist countries (1989–2014), when Cubans lived through the dire economic circumstances that was euphemistically called “the special period.” For them the Cuba of memory and desire is not the same Cuba. Here I focus on these extremes: those who knew, with true nostalgia, still long for the old Cuba, capitalist and democratic, and those who knew only the new Cuba in communism that replaced the old (cf. Eckstein 2009). The most recent publicly available FIU Cuba poll was conducted in 2014, from February to May 2014—before the re-establishment of relations with Cuba was announced on December 17, 2014, and the re-opening of the US Embassy in Havana and the Cuban Embassy in Washington, D.C. that took place the following summer. One can only expect these differences to be more marked in a future poll taken after the re-establishment of relations. However, that these political views were already there, as they have been for many years, only gives them more credence. An important caveat: we must note the demographic shift that lies behind these numbers. Already in 2014 a significant share of the first wave Cubans (who left from 1959–1964) and the second wave Cubans (who left from 1965–1973) were deceased, as this early exodus of people who made the original decision to leave Cuba was quite mature when they left the island. Due to the process of dispossession of the upper and middle classes, those who left Cuba in these early waves were middle-aged: the median age for Cubans who left in those years was around 38 years old (Fagen et al. 1986). A Cuban who left Cuba in 1960 at the age of 40 would in 2014 be 94 years old — likely deceased or too old to participate in any poll. Thus, the early waves of Cuban immigrants represented in this data are really their children — what is often called the “1.5 generation”: those who grew up and were educated in Cuba, knowing and being socialized in the cultural patterns and values of the old Cuba (depending on their age when their parents left). They then came to the US, where they began or completed their education (again, depending on their age at arrival) and often underwent a process of re-socialization to American culture, values, and institutions—though much attenuated by the influence of the Miami cultural enclave that did its best to preserve the old Cuban culture, language, and values (García 1996; Portes and Bach 1985). Still, it is important to recognize when reading this data that those who left Cuba from 1959–1973 in these tables are both people who are quite liberal, such as myself, Guillermo Grenier, and Jorge Duany, as well as quite conservative, such as Jaime Suchlicki and José Azel, rather than our parents, who are no longer with us. The FIU Poll data for 2014 tells us that while 71% of the Cuban immigrants in Miami thought the US embargo of Cuba was not working (FIU Poll 2014: Figure 1), 55–57% of the early exiles (1959–1973) favored continuing the embargo, in contrast to only 42% of the most recent immigrants (1995–2014) (FIU Poll 2014: Figure 2). Overall, a rather large majority of Cubans living in Miami-Dade County favored the US re-establishing diplomatic relations with Cuba (68%), but the contrast by waves was quite dramatic. Among the early exiles, only 40 47% favored the re-establishment of relations with Cuba, while 80%, double the share, of the most recent arrivals favored such a rapprochement (FIU Poll 2014: Figure 4). The pattern was identical with respect to their attitudes towards unrestricted travel to Cuba (FIU Poll 2014: Figure 5). When registered voters were asked how likely they would be to vote for a candidate for political office who supported the re-establishment of relations with Cuba, 58–60% of the “Old” immigrants responded they would not be very likely to do so, in contrast to only 39% of the “New” immigrants. Comparing the results of this 2014 poll with earlier ones, Grenier and Gladwin also highlighted that support for the embargo has steadily decreased — from 87% in 1991 to only 48% in 2014 — in effect, it has nearly halved. In the same vein, support for unrestricted travel has risen — from 44% in 1991 to 69% in 2014. These trends are also the result of another major demographic shift that has taken place in the Cuban immigrant community: the shift in the demographic weight from the early exiles to the recent exiles, as the former have declined (due to normal mortality and low fertility) while the latter have risen (due to immigration). Thus, the attitude shifts here expressed over time are the result of the shift in weight from the early immigrants to the recent immigrants. Over one third of the Cuban-American population in Miami arrived after 1995. The 2014 FIU poll also constituted the first empirical attempt at measuring the actual Cuban vote for a Republican (Mitt Romney) or Democrat (Barack Obama) Presidential candidate in the most recent elections. Both in the 2008 as well as the 2012 elections, Obama gathered about 1/3 of the Cuban vote — 35%. As Grenier and Gladwin point out, however, more important is the trend, that shows an enormous decline in the proportion voting Republican — from 70% in 1991 to only 53% in 2014, with a corresponding increase in the numbers voting Democratic — from 16% in 1991 to 25% in 2014, as well as a similar increase in the numbers who think of themselves as Independent (FIU Poll 2014: Figure 16). Again the differences by waves of migration are stark: only 17–18% of those who left Cuba from 1959–1973 voted for Obama, but among those who left Cuba from 1981–2014, twice that proportion (40–42%) gave him their support (FIU Poll 2014: Figure 17). We can only look forward to the future results on this year’s election. The FIU polls thus give us an excellent attitudinal map of the Cuban community in Miami-Dade County and how it has been changing over time, particularly as the demographic composition of the community changes. If we look at the political organizations that Cubans founded in Miami, however, we get a different map. The many organizations that have sprouted over the years are divided into two “wings”: the Right — who call themselves los intransigentes (and overwhelmingly identify with the Republican Party) (cf. Pérez 1992) and the Left—who call themselves los moderados (and overwhelmingly identify with the Democratic Party) (cf. Duany 2015). Outside these two major “wings” lie a small group of radical Cubans, who support the revolution unconditionally, such as Francisco Aruca, Max Azicri, and the small remnant of the Brigada Antonio Maceo, but they are too small to be consequential. Expressing los intransigentes and the Republican Party we have: the original Cuban American National Foundation (la Fundación, founded by the late Jorge Mas Canosa), los Municipios del Exilio, Cuba Independiente y Democrática (el CID, founded by the late Huber Matos), la Brigada 2506, Unidad Cubana, la Junta Patriótica Cubana (founded by the late Andrés Vargas-Gómez), el Comité Cubano Pro Derechos Humanos, M. A. R. (Mothers Against Repression, Sylvia Iriondo, founder), el Directorio Democrático Cubano (Orlando and Janisset Gutiérrez, founders), el Presidio Político Histórico Cubano (the former political prisoners), Vigilia Mambisa, Alpha 66, and the elected representatives of the Republican Party itself, such as the brothers Díaz-Balart (Lincoln, now retired, and Mario, a current member of Congress), Ileana Ros-Lehtinen, and Carlos Curbelo. While Senator Robert Menéndez from New Jersey belongs to the Democratic Party, with respect to policies and issues pertaining to Cuba he is very much a part of this group. Los intransigentes continue to oppose the normalization of relations between the US and Cuba, seeing it as una traición — a betrayal– and nothing more than giving a dictator — Raúl Castro — what he wanted, in exchange for nothing, particularly not the end of dictatorship and the arrival of true freedom. Their policy choices are for a continuation of the US trade embargo and restricted travel to Cuba—until such a time as free elections in which all the people can participate are held in Cuba. In the same vein, most of them strongly disapprove of Obama’s recent visit to Cuba, though they are pleased that he met with the representatives of civil society — the Cuban dissidents, a meeting that did not take place even during the Popes’ visits earlier. Expressing los moderados and the Democratic Party we have: the Cuban American National Foundation’s more nuanced position at present (under Jorge Mas, Jr.), el Partido Demócrata Cristiano (Marcelino Miyares, founded by the late José Ignacio Rasco), el Partido Liberal (Carlos Alberto Montaner), el Partido Social Demócrata, el Partido Cubano Democrático Socialista (founded by the late Jorge Valls), the Committee for Cuban Democracy (el CCD), the Cuban Democratic Alliance, CubaNow, Raíces de Esperanza, Cuban Americans for Engagement (CAFE), the Miami Cuban Democrats Organization (Héctor Caraballo), the Cuba Study Group and Consenso Cubano (Carlos Saladrigas), and the elected representatives of the Democratic Party, such as Joe García, former US Representative for Florida’s 26th Congressional District, succeeded by the Republican Carlos Curbelo. Los moderados applauded the normalization of relations between the US and Cuba, seeing it as an end to a bankrupt foreign policy of confrontation that has achieved nothing in 55 years, and the arrival of positive cultural influences to Cuba. As Obama himself expressed it, “Let’s try something new.” Their policy choices are for an end to the US trade embargo and an end to restricted travel to Cuba—most of them thinking that this new apertura might serve as an impetus for democratic change (cf. Oppenheimer 2003). In the same vein, the moderados were pleased with Secretary of State’s John Kerry as well as Obama’s recent visits to Cuba, and underline that their speeches did not mince words. Thus, the Cuban American community is deeply divided — though the media seldom portrays it as such, giving voice only to the intransigentes. Indeed, the divisions among Cuban Americans in Miami run deep, and members of all these organizations regularly engage in social activism to make their points of view heard via protests in front of Versalles restaurant; letters to El Nuevo Herald newspaper; regular television appearances, and the like. However, all these organizations have all been founded by the “Old” Cubans, and the “New” Cubans scarcely participate. To my mind, this is due to a number of reasons. One, is the deep divide and mistrust that exists between the “Old” exiles and the “New” immigrants. The “Old” Cubans feel that the “New” Cubans in fact lent their support to and upheld the communist revolution, helping it to succeed, while the “New” Cubans feel that the “Old” Cubans were insensitive to the real problems of inequality in the island that spurred the social revolution. Two, is the lack of grassroots organizations in Cuba that expressed an independent and autonomous civil society in revolutionary Cuba. Several generations of Cubans grew up in the island who were unable to express their political “voice”, but whose only choices were to be “loyal” or to “exit” (cf. Hirschman 1970). This became a cultural pattern that continued after coming to the US. Three, is the excessive politicization of life in Cuba. For half a century, people in the island were asked to be vanguard workers, to donate their Saturdays to the political effort of socialist emulation, to cut sugar cane in mobilizations, and the like. As a result, most of the recent immigrants arrive in the US wanting to do nothing more with the little spare time their low-wage jobs allow them than to watch television and spend time with their families, while helping the family and friends who remained behind in Cuba by sending remittances. Be that as it may, unless the “New” Cubans go on to found their own organizations—a task for which they are culturally not well-suited, as just explained—in the not too distant future the exile community will be far less political and politicized than it has been for over half a century. With the inexorable passage of time, the “Old” Cubans from the immigrant generation will give way to the new generations of their children and grandchildren. But despite the efforts to preserve Cuban culture, these new generations have become American—for better and for worse. Thus, the exile community will be bereft of these political organizations that at present are mostly manned by the “Old” Cubans with the participation of few “New” Cubans and, possibly, even fewer young Cuban-Americans, who lack the felt sense of a life lived in the island. Age, generations, is one of the huge divides in the Cuban American community (Fox News 2014). For the nearly half century since the United States began to provide refuge to Cuban émigrés, a triangulated relationship developed between the US, Cuba, and the exiles that can best be understood with Stéphane Dufoix’s (2000) notion of an “impossible triangle” (see Figure 1). As a concept, the triangle has appeal because it has to do with whose side one is on, as well as with the loyalty or treason that result from belonging to different political communities. Because the triangle that develops is so conflictive, both the home (Cuba) and host (US) societies are involved in intelligence, counterintelligence, and espionage — all activities that involve the exiles. Thus, as Dufoix points out, a great deal of uncertainty exists in the exile community regarding, as Cubans say in Spanish, quien es quien (who is who). Little trust exists even among collaborators, who often see one another as possible traitors. Basing himself on the work of Yossi Shain, The Frontier of Loyalty (1989), Dufoix called the relationship that develops between the home regime (Cuba), the host regime (the US), and the exile community (Miami’s Cubans) an impossible triangle because it is impossible for the host state to recognize the exiles within—to tolerate them or encourage them, thus legitimizing their existence and their political goal — and at the same time to pursue diplomatic relations with the home state. The host state has to side with the one or with the other, but cannot side with both at once. Only when there is an actual war between the two states does the impossible triangle disappear, as the host state and the exiles stand together against the home regime. At such times, governments in exile are recognized. Such was the case during the Bay of Pigs 1961 exile invasion of Cuba. However, at times the war is not an actual war, but is a war by another name—as is the US economic embargo of Cuba. This policy has remained in place due to the insistence of the intransigent “wing” of the exiles, despite a very widespread lack of support for the embargo among the international community and the moderate “wing” of the exiles. Because the triangle is impossible most of the time, on several occasions it has led to the exiles feeling betrayed by the host state when its relationship with the home state becomes more important than its relationship with the exiles. One example is the betrayal involved in the Bay of Pigs (1961) exile invasion of Cuba. Another is the Elián González case (2000). The first major betrayal was at Bay of Pigs, at the hands of a Democratic administration under John F. Kennedy, who tried to “hide the American hand” in the operation, which could hardly be hidden (Pedraza 2007). As a result, Cuban exiles turned massively towards the Republican Party. Electoral data is not available to support this point, since in the early 1960s Cuban exiles had not yet become citizens, nor did they aspire to become so, still imagining exile to be temporary and the return to a democratic Cuba imminent. However, my participant observation among the Bay of Pigs’ veterans confirmed it. The relationship that developed then between the early waves of the exiles and the Republican Party was cemented later when Reagan, partly through his anti- Communism, strengthened the modern, conservative movement. The other major betrayal took place nearly 40 years later, in 2000, under Bill Clinton’s Democratic administration, with the youngest rafter: the balserito Elián González (2007). As was widely seen on television, he was seized by force from his uncle’s home in Miami and returned to his father, for his return to Cuba, over the protests of a large part of the Cuban community who adamantly wished to save the boy from communism. That incident took place just a couple of years after Castro’s downing of the airplanes manned by the exile group Hermanos al Rescate, on February 24, 1996, whose intention was to distribute leaflets with the articles from the Universal Declaration of Human Rights over the city of Havana. The result was the death of the four young men who piloted the two planes. After the downing of the airplanes in 1996, President Clinton sided with the exiles and signed the Helms- Burton Act, legislation the Cuban American National Foundation (CANF), under Jorge Mas Canosa’s leadership, lobbied through Congress. The Helms- Burton Act was CANF’s greatest triumph, though it depended on a notion of dual citizenship, as it asserted that, as Cubans, those who were dispossessed of their property by the Cuban government, were entitled to restitution—as Americans, in American courts (Smith 2000:146) (cf. Roy 2000). Tony Smith (2000:88) pointed out, in his analysis of ethnic group lobbies and the influence the most successful can have on their host governments, that at its most influential in the two presidential elections in the 1990s, CANF was one of the ethnic lobbies that could muster at least $1 million in targeted campaign contributions and 250,000 votes in selected congressional districts. They were also the “voice” of the Cuban- American community. Four years later, however, still under Clinton’s presidency, when the Cuban American community rallied behind the cause of keeping six year old Elián González in the US and not returning him to Cuba, the US withdrew its support from the exiles. The Cuban exiles in Miami stressed that Elián’s mother had died at sea to bring him to the US, a land of freedom, so he should remain in the US, with the Miami family that would gladly care for him. But the boys’ father in Cuba claimed him. Thus, a saga began that made the little boy the center of a struggle between Cuban exiles in Miami and the Cuban government in the island. The Cuban exiles seized the opportunity to politicize the event. They sought to keep Elián in the US, to save him from being brought up under communism. To this end, they underscored that his mother, Elizabeth Brotons, did all she could to save him, to bring him to a land of freedom. Moreover, strong bonds of love developed between the child and his Miami family. In Miami, Elián became a symbol of communism’s harm, a standard borne by the opposition to the Castro regime. Sylvia Iriondo, president of M.A.R. (Mothers Against Repression), expressed it well: “In that child, we saw all the pain and all the suffering of 41 years. Elián symbolizes the pain of the Cuban family, the Cuban families that throughout 41 years of oppression have been divided by one man and one system” (in Bikel 2001). The Cuban government also seized the opportunity to politicize the event. They insisted that Elián was a Cuban child and that his father claimed him to return to Cuba, to grow up with him there. Fidel Castro demanded mass mobilizations and Cubans were rounded up to participate at their workplace and at their neighborhood. In Cuba, Elián became a symbol of the inhumanity both the US and the “Miami mafia” (as Castro repeatedly called the organized exiles) were capable of towards Cuba. Throughout the island, one could see posters depicting Elián’s plight. One showed him behind polka-dot bars, reading Salvemos a Elián (Let us Save Elián); another showed him looking upset and sad, reading Liberen a Elián (Free Elián). Elián was said to be “secuestrado”—kidnapped (Pedraza 2000). As Dufoix pointed out, both the exiles and the home country engage in delegitimation of the other. While the exiles had made the balserito a political cause about not returning to Cuba a child that escaped communism at the cost of his mother’s death, President Clinton, Attorney General Janet Reno, and the Immigration Commissioner Doris Meissner failed to recognize the exiles’ claim. Instead, they sided with the Cuban side of the triangle, insisting that the issue had to be de-politicized since it involved only the return of a child to his father. Thus, they withdrew their support from the exiles and the boy was given to his father. Both returned to Cuba. Elian’s case had a number of consequences. One consequence was that the American people grew sympathetic towards the plight of the Cuban people in the island, their poverty and wants, sympathy which helped to ease the trade restrictions against Cuba. For the first time, the embargo was softened, allowing the sale of food and medicine to Cuba. Through the Trade Sanctions Reform and Export Act (TSRA), the US Congress approved the softening of the trade embargo towards Cuba, which passed the US Senate by the very wide margin of 86 to 8. This was a fundamental shift in US policy: the first US agricultural sales to Cuba in 38 years (Radelat 2000; Agence France Press 2006). Under TSRA, agricultural products and medical supplies have been the two exemptions to the longstanding trade embargo. US exports to Cuba, presently constitute from $300 to $400 million dollars—a very large share of Cuban exports—mostly in sales of poultry, soybean meal, corn, feed and fodders (US Department of Agriculture 2015). Yet another consequence of el balserito’s affair was the massive flight of Cuban Americans away from the Democratic Party. This impact can be seen contrasting the results of the 1997 and 2000 FIU polls in Miami. The polls showed that, of the registered Cuban voters, 33.5% had voted for Bill Clinton for President in the 1996 elections; in 2000, that percentage more than halved, down to 14.9%—the voto castigo (revenge vote) that was a consequence of the betrayal involved in the Elián González case. George W. Bush’s campaign benefited from this electoral shift, with 63.8 % of the Cuban vote in the Miami area going to him. Sergio Bendixen, a Miami-based pollster, pointed to the Elián González revenge vote as the main reason for the increase (Green 2000). 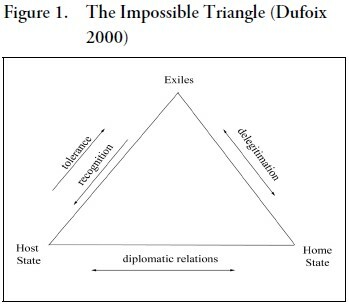 In his analysis of the impossible triangle, Dufoix also noted that the attitude of both the home and host country towards the exiles was marked by different logics. In the case of the host country (the US), the predominant concern regarding the exiles who reside within it is surveillance: keeping an eye on them. At times of war, surveillance can turn into detention and internment. In the case of the home country (Cuba), the predominant concern regarding the exiles who reside elsewhere is to neutralize them. Cuba is aware that, while they successfully externalized their dissent, they also created a substantial opposition abroad. As Dufoix stressed, on a continuum with politics at one end and war at the other end, exile politics are closer to war (seeking the overthrow of the regime) than to what is usually called politics (the art of bargaining, compromise, and negotiation). Over nearly half a century, exile politics ranged from war-like politics to open war. The pre-eminent example of a war by another name is the trade embargo. This policy has remained in place because the intransigent “wing” of the exiles insists on it, despite a very widespread lack of support for the embargo among the international community, as well as the moderate “wing” of the exile community. Examples of real war abound: the Bay of Pigs invasion; other forays into Cuba organized by groups such as Alpha 66. Examples of engaging in war by another name are also real: the trade embargo; the denunciation of Cuba’s human rights violations before the United Nations; and the culture wars that have taken place when Cuban musicians, such as Los Van Van, have come to Miami to play and have met with enormous hostility, reminiscent of the actos de repudio in Cuban political culture. Even when exile politics most resembles normal politics (e.g., the creation of the Cuban American National Foundation whose goal was to lobby the US Congress), its intent was also to accomplish a war-like politics (the passage of the Helms Burton Act, tightening the screws of the embargo). Though united in its rejection of Castro’s communism, the Cuban exile community is more heterogeneous than most imagine, embracing a wide range of political expression across the various waves of the exodus and two major factions, or “wings,” that exist in the organized political community: los moderados (the moderates) vs. los intransigentes (the intransigents, who do not give way). The two major groups share the goal of promoting the return to a democratic government in Cuba, but radically disagree with respect to the means. More often than not, their attitude towards one another is acrimonious and contemptuous. Los intransigentes see war and open confrontation with the Cuban government as the instrument to achieve that end, with violence an inevitable prelude. As the late Andrés Vargas-Gómez, then president of Unidad Cubana emphasized, “Castro will never sit at a negotiation table to negotiate his exit from power.” Thus, they help the internal resistance in Cuba, and the dissidents in Cuba, such as Marta Beatriz Roque, who deny the present Constitution and propose a return to the 1940 Constitution. By contrast, los moderados see constructive engagement with the Cuban government, through dialogue, as the instrument to achieve a negotiated, peaceful transition to democracy. As the late José Ignacio Rasco, founder of the Partido Demócrata Cristiano, explained, “a dialogue is necessary to attain real reforms that will usher in a transition without concessions, violence, or fanaticism.” Thus, it is only sensible for them to help nonviolent alternatives to develop in Cuba. They support the dissidents, such as the late Oswaldo Payá and UNPACU (Unión Patriótica de Cuba) now, groups that work within the limits of the present Cuban Constitution and seek to preserve the advances made in education and health care, yet propose real changes, as a prologue to the achievement of real democracy. Dufoix’s notion of the “impossible triangle” is an insightful way to make sense of the organization of exile politics by showing the inherent instability between the three sides of the triangle that poses distinct dilemmas for each. To los intransigentes, the recent re-establishment of relations between the US and Cuba is just another betrayal by an uncaring US government that has, yet again, sided with the Cuban government, failing to recognize the exiles’ claim. To los moderados it is a harbinger of hope for a different future, a new politics that may serve to empower the Cuban people so that they can take the future in their own hands (Fox News 2014). The tragic history of the Cuban revolution, its exile, and the government of the US continues to repeat itself. Only time will tell which side of the triangle will prevail.